As posted on SNAP CAledon, January 26, 2012. We were hoping if SNAP would attend our upcoming Sleeping Children Around the World Assembly at Palgrave Public School on January 27, 2011, 2:15 p.m.. For the 21st consecutive year, the children of Palgrave P.S. will be raising funds to provide bed kits for those less fortunate. Once again, the Palgrave Rotary has kindly agreed to match each bed kit donation. We are hoping to have people join our assembly or drop off donations at the school. Mr. Dave Dryden from Sleeping Children Around the World along with Wayne Cowell from Palgrave Rotary will be there at 2:15 pm to accept the donations. Order forms are available in the office or online at scaw.org. In the last couple of months a volunteer group of historians have met to research the history of the east division of Ashfield Township, Nile to Lucknow and Shephardton to Lochalsh. A new book published book will replace ‘Frontier Ways to Modern Days’ (Concessions 8 to 14) printed in 1976 and ‘From Bush Trails to Present Tales’ printed in 1980 of Concession1 to 7. It was written 40 years ago. We will be correcting mistakes and adding information that has come to our attention. The land ownership has been compiled for each farm from the crown to today. Family trees that we do not need are listed at www.acwtownship.ca or phone 519-528-3710. We have found many interesting people who had their beginnings in Ashfield such as Murray Dryden, the founder of the charity Sleeping Children Around the World. His grandparents Andrew and Margaret Murdoch Dryden lived at Burnside Farms, Paramount, Highway 86. We have a list of families from the 1881 Census who have no lot or concession numbers. These residents are no doubt living in the log cabins, which have been vacated by the farm owners who have built new frame, stone or brick homes. If you enjoy just writing the stories of your family farm, we would like you to join us on Thursday, Jan. 19 at 1:30 p.m. at the home of Warren and Marian Zinn. As posted by the The Peterborough Examiner, January 21, 2012. CLIFFORD SKARSTEDT Examiner Former Peterborough MP and MPP Peter Adams, seen March 30 addressing the crowd during the Peterborough Speaker Series, will be invested into the Order of Ontario at a ceremony on Thursday. Two weeks ago Peter Adams got some pretty surprising news. The former Peterborough MPP and MP found out he was awarded the Order of Ontario, the province’s highest honour. A ceremony for the prestigious acknowledgment takes place Thursday at Queen’s Park in Toronto. But Adams wasn’t allowed to tell anyone. He was asked to keep the award secret until recipients were announced. Receiving the Order of Ontario is a tremendous honour, he said. Keeping it a secret was a bit difficult, he said, particularly during the first few days. He also had to postpone a couple of meetings scheduled for that day, he said, without any explanation for the cancellation. With a laugh, he said he has already rented his tuxedo for the prestigious ceremony. Adams doesn’t really know why he’s been selected. It’s rare for politicians to make the list, he said, so perhaps it has something to do with his community involvement or academic work. The synopsis next to his name didn’t offer much insight. “I guess until I hear the citation Thursday I won’t know for sure,” Adams said, after hearing the description. He also doesn’t know who nominated him, and is hoping next week’s ceremony illuminates that piece of the puzzle. 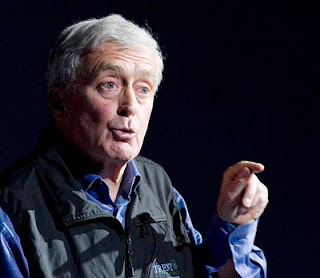 Adams has received an honorary doctorate from Trent University in 2010 and remains professor emeritus there. He was one of the founding members of the university’s geography department. He chaired the Sport, Recreation and Wellness for All Campaign at Trent University, which exceeded its goal of $4 million for the new athletics centre at the university. He’s also authored numerous books and advocates for numerous causes like Sleeping Children Around the World, an organization that delivers bed kits to children in developing countries. But Adams said it’s his work representing Peterborough riding residents that he’s most proud of. Adams served as MPP from 1987 to 1990 and as MP from 1994 to 2005. NOTE: Other names on the list include John Tory, former leader of the provincial Progressive Conservatives, and Linda Schular, co-creator and executive producer of the Degrassi television series. There are 27 people who are receiving the order Thursday. As posted on TCP News, January 19, 2012. TCP [The Community Players, New Hamburg, ON] supports Sleeping Children Around the World through show proceeds. Providing financial assistance and making a difference within the community is an important part of what TCP is all about. With each production, the leadership team deliberates at length what organization(s) they feel they would like to support with a portion of the show proceeds. In 2011, with TCP’s production of Elton John and Tim Rice’s Aida, it became evident that we were telling a story about countries (Egypt and ancient Nubia) where power struggles affected the lives of everyone, often displacing whole societies, and leaving those afflicted by war, with nothing. We were launching our production at a time when that part of the world, modern day Egypt, Libya, Tunisia, and others, was experiencing intense political turmoil. With that turmoil in mind, and the effect it could have on the average person, particularly children, we felt that we wanted to reach further afield with our donations. In looking for an organization to donate to, we came upon Sleeping Children Around the World (SCAW). SCAW provides bedkits to children of any race and/or religion who will benefit the most, typically being located in underdeveloped and developing countries. 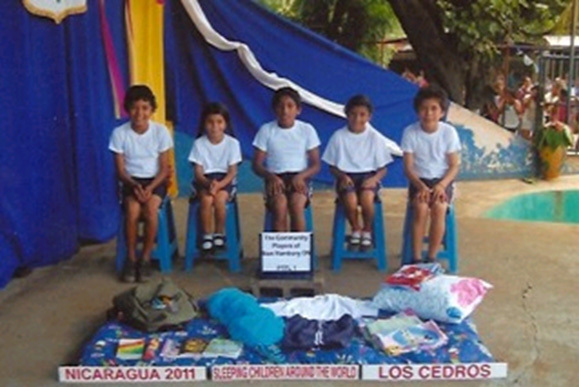 No portion of a bedkit donation is spent on administration – 100% of it reaches a needy child. Dedicated to the concept of “freewill giving”, SCAW strives to provide hope and always aims to preserve the dignity of the child. In an ancient world, such as that depicted in Aida, and in our modern day world, where the needs and dignity of the most vulnerable are often forgotten, we felt that providing some of TCP’s annual donations in the form of bedkits for children in underdeveloped or developing countries was a good place to put our support. We were pleased to receive a picture of the five children that our funds assisted, in Nicaragua. SCAW groups have traveled to a number of other locations since May 2011 and TCP’s production of Aida, including Uganda, Tanzania, Sri Lanka, Bangladesh and Honduras. For more information on Sleeping Children Around the World, and how they are helping those most in need, visit their website at www.scaw.org. Submitted by Lynette Jenkins, January 12, 2012. 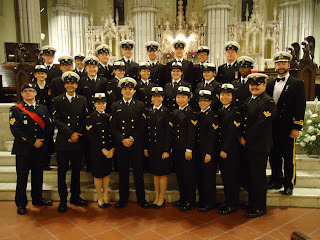 On the 3rd December 2011, we had our 13th concert "An Evening With Lynette And Friends" at St. Paul's Bloor Street. We raised $6,211.40 for Sleeping Children and everyone seemed to enjoy themselves - audience and performers alike. 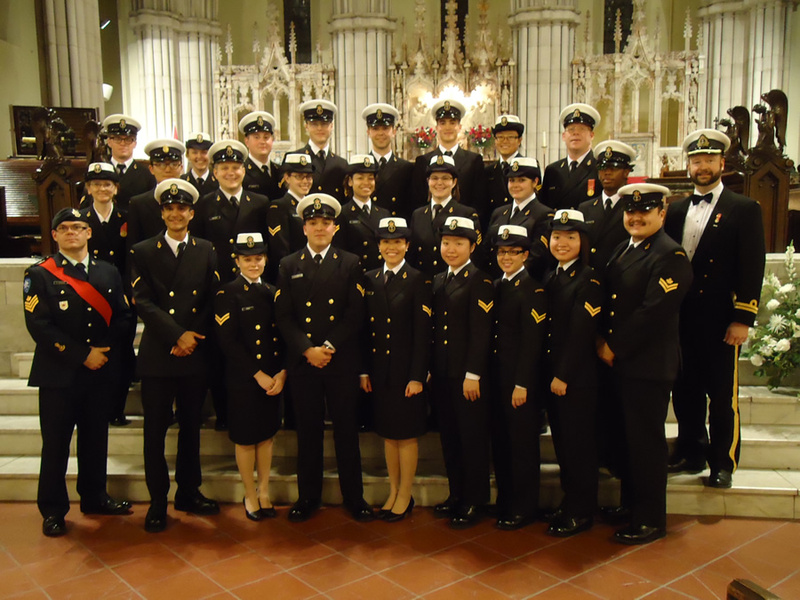 The performers included Cosburn Middle School Choir and Band; Subhadra Vijaykumar a carnatic violinist; The Natya Tapaya Dance Academy; Toronto All Stars Steel Orchestra and students from Rosedale Public School steel drum band; Marni Levit with djembe drumming from Africa; and HMCS York Naval Band (Pictured above.). Many thanks to the artists performing, the members of SCAW who gave their time to help with sales and bedkit display and the friends who attended and contributed to the evening. We have booked the church for the 14th concert which will be the 8th of December 2012. Please mark it on your calendars now. The more people who come - the more children we can help. Thanks for all your interest and involvement. The holiday season is traditionally a time for people to step up and share with those less fortunate, and many in the Caledon community did just that this year. Ellwood Memorial Public School in Bolton pitched in too. Principal John Stegeman said some 1,500 cans of food were contributed to CCS. He also said the school assembled 67 bed kits to go to Sleeping Children Around the World. As well, the school sponsored a local family in need.